Kahoot unveiled a new game-based learning app for iOS and Android devices at last week's ISTE 2017 conference in San Antonio. Kahoot is a free game-based learning platform that allows teachers to create their own learning games, dubbed Kahoots, or use existing games created by other teachers. In the classroom, games can be displayed on a shared screen to encourage students to work together. 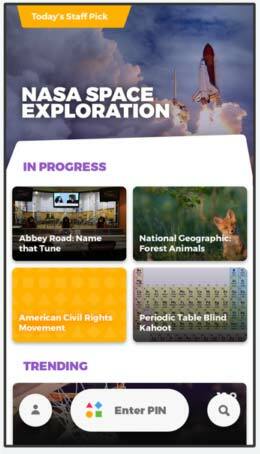 Students can also create their own Kahoots to deepen their understanding. The new app allows teachers to send students challenges as homework and allows students to practice anywhere and anytime they like, alone or with other students. The ability for teachers to send homework challenges students can meet through the app or their computer. "Teachers and students love playing Kahoot and don't want to stop when the bell rings," said Erik Harrell, CEO pf Kahoot, in a prepared statement "With our brand new app, we facilitate a continuous learning loop, letting students play the challenges wherever they are. Kahoot! makes learning awesome — and now homework, too! We are excited to launch the final version of the app for the new school year in a few months." More information is available at kahoot.com.